The Butler University Bulldogs are celebrating a number of achievements for the 2009-2010 athletic seasons. Not only did the Butler Bulldogs advance to the NCAA&apos;s magical Final Four in basketball, but on the gridiron, the Bulldogs achieved record-setting milestones by going 11-1, topping the Pioneer Football League, capturing their first post-season win and winning the Gridiron Classic and the Hoosier Helmet Trophy. And success on the field has now translated into achievements of another flavor. On April 19th, Butler University Director of Athletics Barry Collier announced a major renovation initiative for the 72-year old Butler Bowl. "The renovations at the Bowl will provide a great venue for our student-athletes and coaches to compete in and will support their tireless effort to accomplish team goals." stated Collier. After an exhaustive search, Butler selected the award-winning team of Southern Bleacher Company of Graham Texas to manufacture and install their new state of the art bleacher system. Butler also selected architects OMS of Indianapolis Indiana and general contractor Venturi Paine Construction of Indianapolis Indiana. 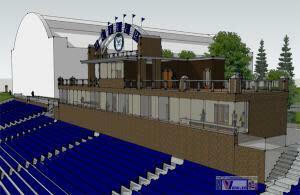 The renovation of the facility just east of Butler University&apos;s historic Hinkle Fieldhouse will increase the seating capacity to 5,547 with the addition of 5,109 new bleacher seats including suites along the west side of the field and 438 new bleacher seats for visiting fans on the east side. Funded by the ButlerRising capital campaign, the renovations to the Butler Bowl mark a milestone for the stadium renovated in 1955 and 2004. Originally built in 1928, the Butler Bowl is home to BU&apos;s football and men&apos;s and women&apos;s soccer programs. The current renovations are scheduled to be completed in time for the fall season and include seating by American Seating Company and Southern Bleacher&apos;s premium Vertical Rail system - an alternative to traditional chain link. Vertical Rail can be installed anywhere chain link is currently in use and can also be used in combination with chain link and offers a clean, attractive and stylish safety option. It enhances entrance and exit ramps and portals. It creates a pleasing contrast with the horizontal lines of our anodized aluminum pickets that can be finished with Southern Bleacher&apos;s Dur-kyn paint system for a lively and individualized appearance. Southern Bleacher&apos;s Garrett Pettus, "The renovation project represents an important milestone not only for the Butler Bulldog&apos;s athletic aspirations, but also highlights Southern Bleachers&apos; ability to deliver award-winning products and services at an extremely competitive price given current economic market conditions. We are proud to partner with Butler University and the ButlerRising capital campaign committee to quickly deliver on our brand promise and look to complete the project before the 2010 football campaign begins and see the Butler Bulldogs to another Pioneer Football League championship." Since 1946, Southern Bleacher has set the standard of excellence in design and manufacturing of sports stadiums and entertainment venues; they are the nation&apos;s largest stadium manufacturer. Southern Bleacher&apos;s comprehensive services include budget analysis, estimates, proposal drawings and specifications at no cost. Clients will benefit from their vast experience in addressing the myriad of building-code requirements, accessibility issues, safety requirements and lines of sight that fans will cheer about. Southern Bleacher&apos;s products grace soccer fields, college campuses, school districts, NASCAR tracks and rodeo arenas across the US.